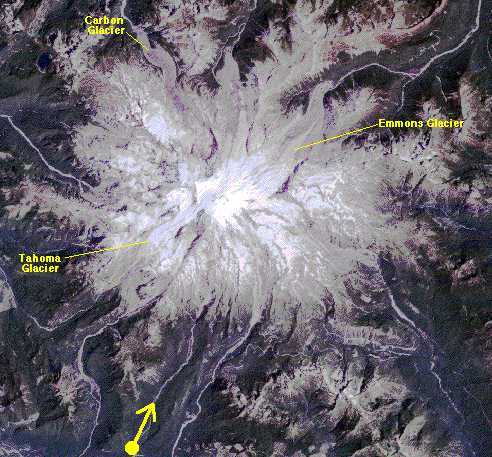 Enlargement of Mount Rainier seen in aerial photograph. Colors in this image have been stretched to show the glaciers, which would otherwise appear a featureless white. Yellow spot with arrow shows approximate location of airplane and viewing direction of the camera when the photograph was taken. Image: S. K. Croft. Raw TM scene #Y5308418181X0. These data are distributed by the EROS Data Center Distributed Active Archive Center (EDC DAAC), located at the U.S. Geological Survey's EROS Data Center in Sioux Falls, SD.